The Beads of Courage programme is designed to provide an additional treatment and offers support for children and teenagers undergoing serious illness and treatments. The initial reaction to the Beads is “aren’t they pretty” but it is not until you see it in action and talk to children and care givers that you can see the impact that they have. This programme supports more than 20,000 children in the US, Japan and New Zealand and has been evaluated over the past eight years. 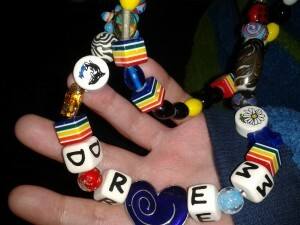 Beads of Courage restores a sense of self in children coping with serious illness. The programme also provides something tangible that a child can use to tell family and care-givers about their experience during treatment. The beads also help explain to teachers and friends what has happened to them whilst they have been away from school. Parents of younger children enrolled in the programme can use the beads in the future to explain to their child what they have been through. The beads help the children to take ownership of their journey and to make sense of the experience they are going through in a very visible and tangible way. The beads gives them a tool to explain it to themselves and others, adults, medical professionals, brothers, sisters, friends and says to everybody “this is my story, this is what I’m doing – its not nice but I’m strong and I will get through it”. The process of a child telling their story beings with understanding what is happening to them. Putting experience into words helps them to recognise their condition more clearly. It also helps medical staff when they are talking to children – it isn’t easy being at the front line of caring for children coping with cancer and their families. One nurse said “I didn’t realise how exciting BOC would be for some of the kids. They could be having the worst day where nothing you do makes them smile, but when you walk in the room with a bumpy bead or beads for that day, for one brief moment all the pain and discomfort seems to go away and suddenly a smile appears. It’s very encouraging to watch”. The children’s beads of courage collection helps others to understand what these children go through and shows their strength and courage. As their string of beads grows, it is something that they can use to remember and retell the story of their treatment. It is also about taking control of a tough situation. With each procedure or milestone in their treatment, they get a special bead. Each bead is their way of saying “this isn’t easy, but I did it”. Another nurse said “I never would have expected for the beads to have such an effect on anxiety as well as compliance issues related to taking medications. I have also seen changes in patients coping skills and confidence with active involvement in this programme”. Upon enrolment into the programme, each child is given the Beads of Courage bead colour chart. Their BOC journey begins when they are given a length of string and beads that spell out their first name. Then, colourful beads, each representing a different treatment are given to the child by their professional health care provider as determined by the BOC bead guide. During the course of their treatment, they are also given “Act of Courage” beads. All programme beads were developed in collaboration with experts in the field (nurses, doctors, child life specialists and social workers) so that each bead would reflect meaningful acknowledgment of a child’s treatment journey. Be Child Cancer Aware is sponsoring the Beads of Courage programme in the UK and our aim is to provide this amazing programme to as many oncology wards in UK hospitals. To do this, we need to raise funds. One child’s treatment beads costs us £50.00 – what medication can we say costs £50.00? Please take a look at our Beads of Courage pages to see if there is anything there that you are interested in doing to help us to achieve this.